If the world ends in 2012, the sun won't be to blame, NASA officials say. 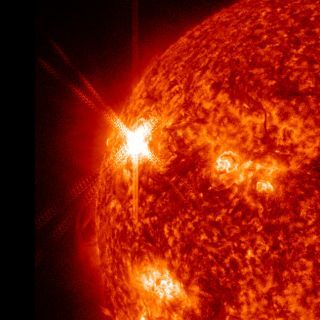 Contrary to what some doomsayers would have you believe, our star isn't capable of blasting out a solar flare powerful enough to burn our planet to a crisp, according to the space agency. "Most importantly, however, there simply isn't enough energy in the sun to send a killer fireball 93 million miles to destroy Earth," NASA officials wrote in a Nov. 10 statement. The Mayans' "long-count" calendar is set to expire on Dec. 21, 2012, marking the end of a 5,126-year epoch. This factoid has inspired some folks to start girding up for the coming apocalypse — and to start predicting what may bring it about. The sun is indeed building up toward the peak of its 11-year activity cycle. But that peak is expected to come in 2013 or 2014, not 2012, researchers said. Also, countless solar maxima have come and gone over the years, and we — and the Earth — are still here. But that reasoning is all secondary to the main point, which is that a flare's sizzling heat cannot make it all the way to our planet, researchers said. The sun's rumblings can and do affect our planet, of course. Flares, for example, can temporarily alter Earth's upper atmosphere, causing disruptions in satellite communications. And coronal mass ejections (CMEs) — huge eruptions of solar plasma that streak into space at 3 million mph (5 million kph) or more — can be even more troublesome. CMEs that hit Earth can knock out GPS signals, radio communications and power grids. A powerful, well-aimed CME could thus wreak serious havoc on our increasingly tech-enabled and tech-dependent society. But it wouldn't destroy the planet or wipe out humanity, researchers said. The candidates to bring about the end times next year keep dwindling. Comet Elenin, which some observers speculated would align with other heavenly bodies and spur massive earthquakes and tsunamis, broke up recently after zipping close to the sun. The supposed planet Nibiru has also been heralded as an agent of apocalypse. The rogue body, which is thought to be four times the size of Earth, will smash into our planet next year and kill us all, some predict. The problem with that theory is that Nibiru, also known as Planet X, doesn't exist, experts say. "There's no evidence whatsoever for Nibiru," Don Yeomans, manager of the Near-Earth Object Office at NASA's Jet Propulsion Laboratory in Pasadena, Calif., said in a recent NASA video. "There's no planet Nibiru, there's no Planet X, and nothing is hurtling toward us." Yeomans isn't planning to make any apocalyptic preparations when December 2012 rolls around. "I'm not going to lay in any extra supplies — no survival gear," Yeomans said. "I'm just going to lay in an extra supply of egg nog for the coming holiday season."